Posted on Thu, Mar 8, 2012 : 5:38 a.m.
Manchester will look to guard Taylor Manders, center, and her younger sister Jessie to complement star forward McKenna Erkfritz in Thursday's regional final. After winning its first conference championship this season, the Manchester High School girls basketball team is looking to win its first regional championship when it faces Riverview Gabriel Richard Thursday night at Summerfield High School. Manchester is led on offense by 6-foot junior forward McKenna Erkfritz, who had a 20-point, seven-rebound performance against Madison. 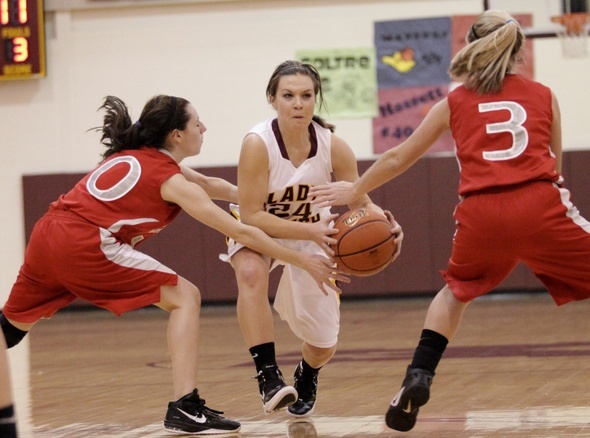 The Flying Dutch also turn to sisters Jessie and Taylor Manders for outside shooting and driving the lane. “It’s not going to be one kid that carries this team,” Kastel said. Riverview Richard won the Catholic High School League in 2012 for the first time in the school’s history, finishing the regular season with a 16-4 record under the direction of first-year coach William Jones. The Pioneers cruised to a 67-36 win over Britton-Deerfield in their regional semifinal. Jones knows Erkfritz will be a challenge, but believes his team will be up to the task. “There are going to be some interesting things we have to do to keep her under wraps,” he said, adding that he doesn’t expect to shut Erkfritz out completely. Sisters Lauren and Ashley Henderson pace the Pioneers, who are a fairly young team with only three seniors (Lauren being one of them) on the roster. Ashley scored 31 points in the team’s win on Tuesday. On defense, Riverview is a zone team that likes to pressure the ball and force turnovers, while using different defensive sets. But that doesn’t seem to concern Kastel. “We’ve seen many different defensive sets, so I’m not worried about that,” Kastel said, adding that her team will need to focus on getting open without the ball and making smart decision with the ball.